EXETER – The Monarchs checked the last box on their list of reestablishing their dominance in the Central Sequoia League last Thursday night. For the first time since 2008 the Monarchs swept the Central Valley Christian Cavaliers in league play with a 4-1 (26-24, 25-15, 23-25, 25-17) win. “I told them before the game that I needed them to dig deep, band together and to get this win, and that is exactly what they did tonight,” Exeter head coach Samantha Hilvers. Similar to the first time that both teams meet the Monarchs (25-8, 8-0) had a chance for a sweep. For the third set in a row Exeter had jumped out to a 7-3 lead. They were able to keep close to that margin for much of the night. 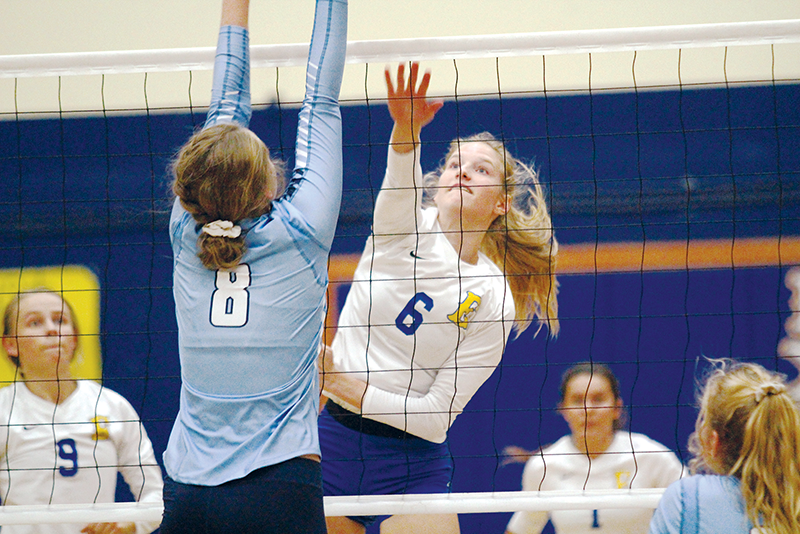 It wasn’t until both teams were in the twenties that CVC (13-12, 6-2) took the lead for the first time 23-22. Exeter did pull even with CVC with a kill from Mattie Fry, but two subsequent errors by the Monarchs handed the Cavaliers the win. According to Hilves after the set loss all the energy seemed drained from her players. “I just tried to get them to relax a little bit so they can come back, and not be down on themselves,” Hilvers said. For the first time since 2008 the Monarchs swept the Central Valley Christian Cavaliers in league play with a 4-1 (26-24, 25-15, 23-25, 25-17) win. Photo by Patrick Dillon /@PDillon_SGN. In the fourth set the Monarchs in did come back, even though the first five points scored saw Exeter trailing for the first time that early in a set. But Exeter scored five straight points to regain the lead. From then the Monarchs had complete control over the match, eventually Julia Nelsen delivered the game winning kill. Nelsen finished with eight kills on the night which is one of the most for an Exeter inside hitter this season. Hilvers has been trying to get her team to set more to the inside instead of always setting to their dominate outside hitter. On this night they used their speed to spread the ball along the net to keep CVC guessing, and it just happened a lot of the sets went to interior hitters. “We’ve been really working on spreading the ball from pin to pin,” Hilvers said. Exeter has been able to keep this lead in the CSL going despite a couple of key injuries. Only two days before the CVC rematch Corinne Acosta twisted her ankle. It affected her production in the first set, but she still led the team with 18 kills. Also, due to a wrist injury to setter Grace Germaine, some of the Monarchs other setters saw a lot more playing time than they are used to. Now with four CSL games remaining in the regular season the magic number for the Monarchs to clench their third straight league title is two. However, for Hilvers just clenching will not be enough as she wants to win the title undefeated. Exeter took a step toward that goal last night at home against the Selma Bears. The final happened after press time. Tomorrow night Exeter’s home stand continues as they take on the Hanford West Huskies. First serve is slated for 6 p.m.